Könnten Wir Bitte Ihre Leere Plastikflaschen Und Dosen Haben? Münster is an independent city in North Rhine-Westphalia, Germany. The city is regarded as the cultural centre of the Westphalia Region and renowned as the bicycle capital of Germany. Recently a friend of mine visited that lovely city and returned with the following true story. Leading a group of some 20 other persons in Münster; my friend became aware that they were being followed, from a distance, by two elderly and possibly homeless persons. My friends group paused for a while at a nearby recognised picnic site, to consume some snacks and drinks, before being approached by these gentlemen, who inquired formally in German, “Könnten wir bitte ihre leere Plastikflaschen und Dosen haben?” One of the company who spoke the German language translated; “Please can we have your empty plastic bottles and cans”? My friend explained that in Münster as indeed in Germany, a deposit refund system was in place, to repel the growing plastic waste crisis. 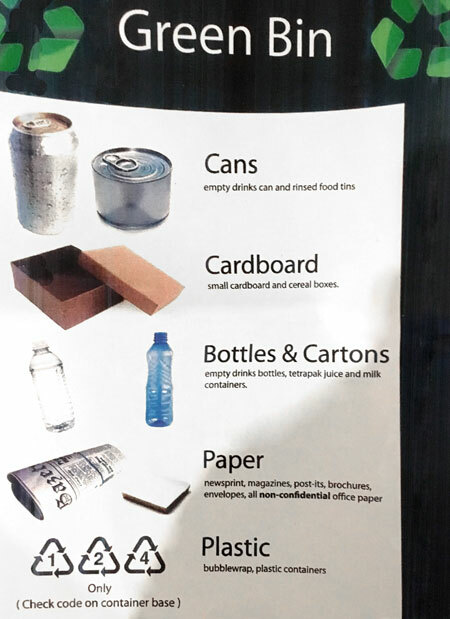 Every drink can and plastic bottle collected, when returned to vendors, is rewarded by a payment of 15 cents each, which had been previously charged when the product was initially purchased. These two men would redeem €3.00, if 20 plastic or metal drink containers were returned to vendors. The returned containers are then reused or recycled. This system of recycling has proven to be extremely effective in the recovering of up to 98% of all such containers. Drink containers are the convenience packaging for products used for outdoor recreation. Here in Ireland our metal cans and plastic drink containers are to be found dumped in every nook and cranny. “Tidy Towns” judges, together with the “Irish Business Against Litter (IBAL)”, regularly highlight the issue within towns and villages, but rural country areas remain ignored with same items dropped to roll around on our streets; to be thrown into our gardens and unto our road sides by passers-by and motorists; while also being dumped into our rivers and onto the 7,000km of our golden beaches, to become the flotsam and jetsam of “God knows where,” depending on the currents and Tides. The “Repak Model” of recycling is seen as being adequate by a short sighted Irish Department of the Environment. However, while it may be profitable for Repak; do take a look around our streets and you will see Ireland operates a “one use and then litter” model, with immediate change now fundamentally crucial. It would appear that our appointed legislators are possibly under pressure, from waste collection business operators, latter who only manage to recycle about 39% of our cans and plastic bottles (given to them for free), leaving 61% (43,000 tonnes) to decorate our green landscape. But imagine the difference it would make to our unspoiled coastal regions; our rural countryside, our villages, towns and cities, if a deposit refund system were to be put in place, in a state that is growing more and more dependent on regular foreign Tourism. The Netherlands, Germany and Denmark have operated successful ‘deposit refund systems’ for years. The UK have just announced they are about to introduce a similar deposit refund scheme, while Ireland continues to drown in its own litter, dependent on individuals to come out, voluntarily, to pick up and clean up after those who dump their unwanted garbage. God be with the late 50’s, when my friends and I would rush down to the village with our empty ‘Taylor Keith’ cochineal reddened, fizzy, lemonade bottles and with the refund, buy a few Peggy’s Legs or a few strawberry flavoured Bubble Gum Balls, [latter banned in my house because same were seen to be ‘dirty’ and ‘unmannerly’, according to my grandmother, especially “in front of other respectable visiting adults.”]. Here in Ireland we will probably have to wait until the EU make ‘deposit refund systems’ compulsory, and the sooner the better. Understandably reverse vending machines operating a deposit-and-return drinks container regime, is not as popular with our elected County Councillors, as are Parking Metres in our town centres. Games Fleadh 2018, which was schedules to take place at LIT Thurles Campus tomorrow, (Wednesday, February 28th, 2018), has been postponed until Thursday March 22nd, 2018, courtesy of expected blizzard “Storm Emma”. The organisers of this popular all-island games design and development event, have reviewed the weather forecasts over the past 24 hours, and have decided to postpone the 15th Games Fleadh in the interest of commuter safety. A Yellow weather warning for several counties, including Tipperary, has now come into effect with Met Éireann expected to issue a Red weather warning in the next days or two. Weather experts have predicted a polar vortex will blitz Ireland with its worst snowfall in 36 years; to materialise over the coming days, with up to 65cm of snowfall expected to fall on higher ground across the county between Tuesday night and Friday. If you would like to track the expected “Storm Emma” blizzard over the coming days simply click HERE courtesy windy.com. Some fifteen LIT Thurles students in total have been recognised for their achievements in game design and development at Games Fleadh 2017. The Games Fleadh is an annual all-island games design and development competition for third-level students. 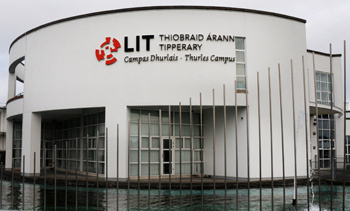 Same took place on March 8th last on LIT’s Thurles campus; latter home to a B.Sc in Computing in Games Design and Development. 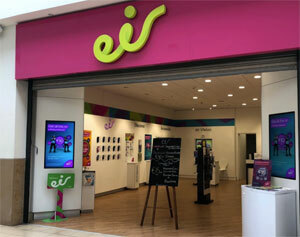 The 14th annual Games Fleadh event was once again supported by Microsoft Ireland; EA Games; First Data; Game Sparks; Game Stop and the Irish Computer Society. With over 30 teams taking part in various game design and development competitions, the event organisers are happy to report 2017 as their busiest year yet. All entries were viewed, played and tested by over 400 members of the general public, who flocked to the event. Judges included representatives from EA Games, Game Sparks, and First Data, who each reviewed the individual entries; scoring the students on their game creations. Fourth year Game Development students Declan Cordial, James Walsh and Shane Hayes with their entry ‘Fragments of the Damned’ won ‘Best in Original Audio Music’. Third year Game Development students Joe O’Regan, Sean Horgan and Brian Ryan won ‘Best Windows Game’ with their entry ‘AntiBody’. Another 3rd year Game Development team made up of visiting Canadian students Christopher Law, Noah Petrides, and Settimio Falsetto, were awarded ‘Best in Team Performance’ for their game ‘LightWave’. Second year Game Development students Alex McAllister, Eoghain McGrath, Luke O’Brien and Nathan Dunne, were awarded ‘Best in Game Design’ for their game ‘I Wanna Be A Racing Game’. 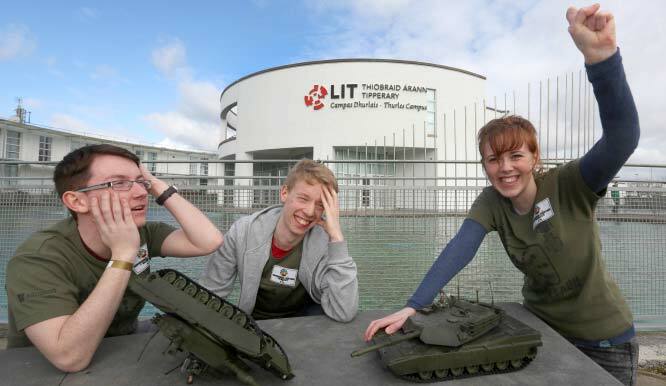 First years LIT’s Robocode Team comprising of students Ciaran Bent, Rory Ryan and Owen O’Dea were placed 3rd in the national Robocode Competition, which involved programming software tanks using the programming language Java. Congratulations to all those competing. Limerick Institute of Technology (LIT) situated here in Thurles, Co. Tipperary, will be hosting Ireland’s largest gaming event this year on Wednesday next, March 8th 2017. The theme for this years 2017 event is “Racing Game”. 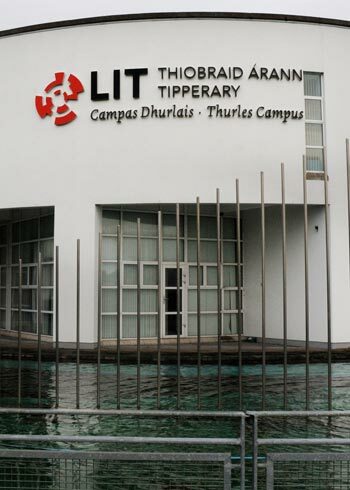 LIT Tipperary is home to Games Design & Development with a BSc (Honours) obtainable in Computing (Level 8). For further information on this graduate programme click HERE. This year the Games Fleadh will also feature games development and research discussions with industry veterans and researchers. Companies and organisations taking part in discussions will include Microsoft Ireland, EA, Imirt, Game Sparks and SimVirtua. The full list of speakers is now available on their Gamesfleadh.ie page. Games Fleadh 2017 while open to the public for free; tickets can now be reserved on their tickets page here. For more follow @gamesfleadh on twitter .